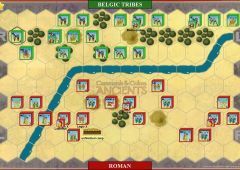 With most of Gaul under his control, Caesar saw a need to pacify the nearby British coast, lest this island serve as a sanctuary and base for anti-Roman Gauls. 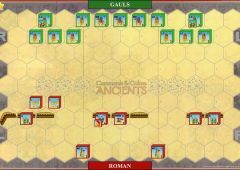 Caesar sailed to Britain late in the campaign season with only two legions. 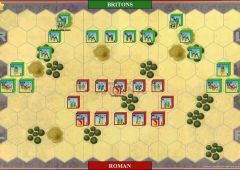 The intended landing sight, above the cliffs of Dover, was lined with warriors, which forced Caesar to sail further north. 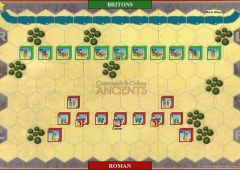 The British cavalry and chariots kept pace with the fleet, however, and when the ships landed between Walmer and Deal, the Britons were waiting. 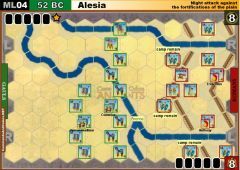 The heavily laden Roman troops could only land by jumping into the sea and wading ashore. 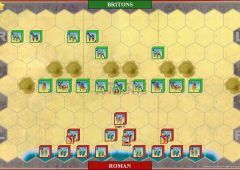 Wild melees ensued all along the beach and only after a number of cohorts gained dry land, following the lead of the Tenth Legion, did they form up and charge. 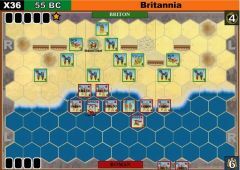 This attack finally drove the Britons from the beach. 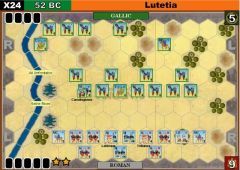 Without cavalry, because his cavalry transports never arrived, Caesar was not able to turn the retreat into a rout. 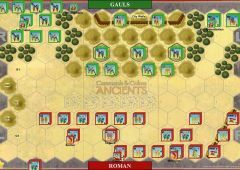 News spread of the Roman victory and tribal chiefs appeared before Caesar to offer submission. 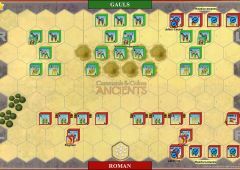 Unfortunately, a violent storm shattered the unprotected Roman fleet, and Caesar was forced to return to Gaul before he could exploit the fruits of this first invasion. 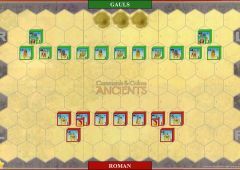 • Place a Special Unit block in the Tenth Legion hex. 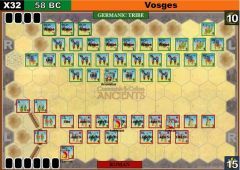 The Tenth Legion possesses all Tenth Legion Special Unit abilities. 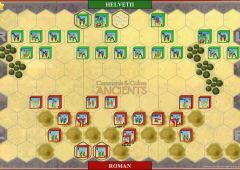 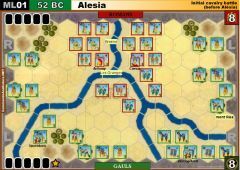 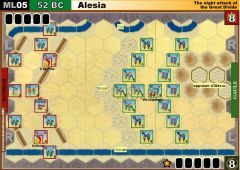 The Romans advance in the center seemed unstoppable and with a "clash of shields" card they took control of the hills. 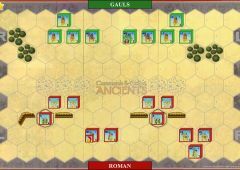 But the friction of war and some lucky fire roll by the Britons led to the loss of the tenth legion and Caesar. 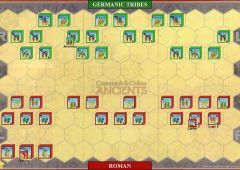 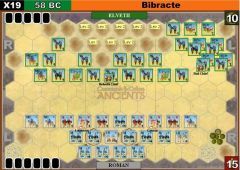 Moreover the Britons cleverly retired from the center and the Romans had to restart the advance process on their left flank. 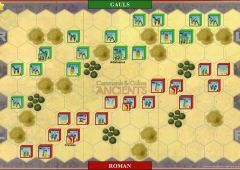 However, now the Barbarian troops were scattered and an easy prey for the Roman legionaries. 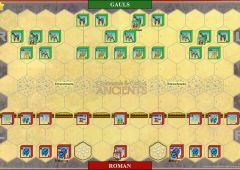 Played this against King Billy as the Romans. 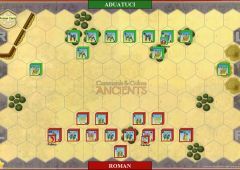 An easy win for Caesar in the end despite the early loss of the Tenth Legion and some archers (0-2). 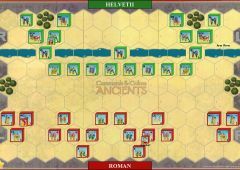 The Romans managed to get off the beach easily with a timely Line Command that punched a huge hole in the British line (3-2). 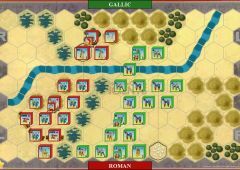 Eventually the Britons ran out of units with enough clout to hurt the Romans as Caesar and his cohorts muscled their way towards the hills (5-2). 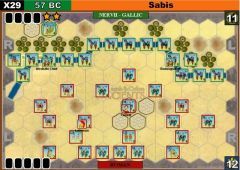 A last gasp charge by the British forced some losses on the Romans but a 'Order 3 units Centre' saw the legions advance on the weakened Celts and take victory decisively with Caesar at the fore (7-2).